This exfoliating soap is formulated with wheat bran to help cleanse and exfoliate your skin softly. While wheat bran aids in getting rid of dead skin cells, it also encourages skin cell regeneration. This soap is also enriched with glycerin, which helps to keep your skin soft and moisturized. Without exfoliating skin, dead and damaged skin cells aggregate and clog pores. These dead and damaged cells contribute to blemishes like blackheads, acne breakouts, eczema and other severe irritations. It's no accident wheat bran is a frequent ingredient in high quality skincare products. These nutrients are antioxidants, which help protect skin against damaging free radicals. This soap helps to remove dead and damaged cells while also replenishing moisture to depleted skin cells. Be aware that exfoliating skin can go too far: you only want to remove dead skin cells, not the healthy cells underneath. To determine how frequently to use the exfoliating bar soap, judge by your skin type. For dry skin: use once to twice a week. For normal to oily skin: use daily or every other day. (The rest of the time use O'tentika� Hygienic Complexion Soap). If redness or irritation results, reduce the frequency of use, or discontinue. 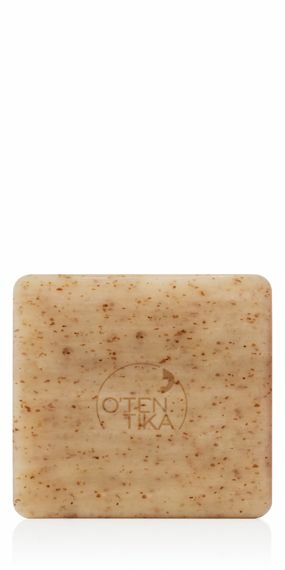 Like all similar beauty products, O'tentika� Exfoliating Soap is intended for external use only. Avoid contact with the eyes. Do not use on children under the age of 12. Finally, be sure to brush your teeth, because you'll find yourself smiling more often at your brighter, luminous skin.